After visiting Kiek in de Kök, a 15th-century cannon tower in Tallinn Old Town, and witnessing exhibition about the city’s days of glory but also suffering through plague and wars, I found that it was appropriate time to check the album of Cosmos Laguna. 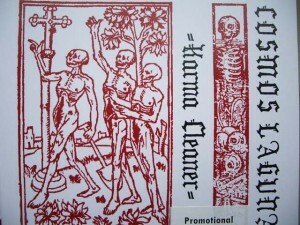 Macabre artwork looked very medieval, is it another strike of black metal? First two tracks, “Cancer” and “Underwaterwar”, made clear that the release is about electronics, although the first two sounded like noisy big beat and I did not have much fun yet. Then the game really started: DAF-like bass line in “Chaos City” worked in harmony with bone-dry shuffling loops and effects, the second half of the track getting pretty mad. Then I lost my mind. “Bel-Air Trash Disco” kicks off in almost ambient mode, like ice-cold water dripping from the roof of an undercover cave. But then the machines start to bite with inflating hip-hop-reminiscent beats and larger than life industrial horns start to drill your body and mind. New and new layers of hard electronics shake the walls, it is evil and it is terrific. It is really an outstanding track – last time it was Ancient Methods that made me such goosebumps. Knowing that the cut is dedicated to Tallinn’s legendary mid-90’s club Bel-Air adds extra value. And the ride went on. “Mover” has a more delicate start, I could almost imagine De La Soul coming to do some rhymes, but then sentimental synths in the background give room to heavier stuff. Like many other tracks, “Please Don’t Kill Me” has a majestic intro and builds into a more experimental and heavy cut. 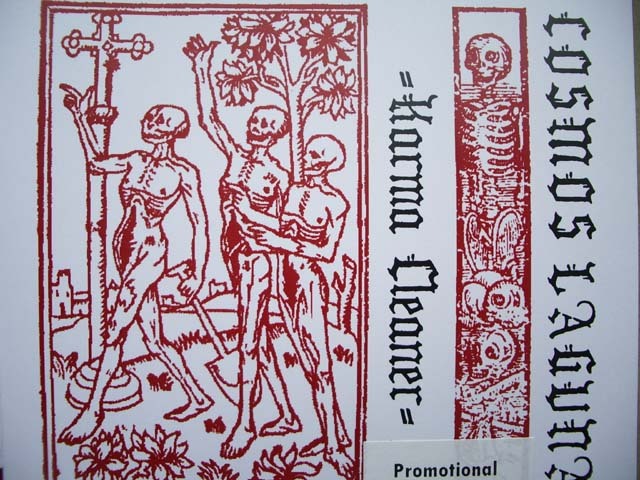 In “Karma Cleaner” vocoded warriors from Saturn speak, in a reverse mode, assisted by ambient layers and guitar, before we face the truth of flesh-eating synthetic sequences again. “Midnight Silence” and “Memory Begins” are fat and ugly, the latter searching for the melody. Distortion is a companion in many tracks. With Cosmos Laguna the samizdat label Trash Can Dance has found an artist that could join respected line-ups of experimental techno floor.